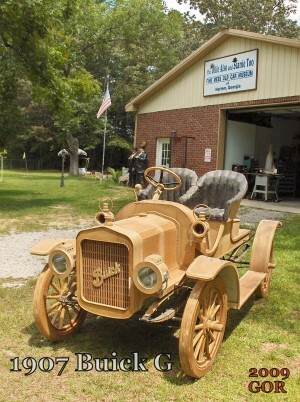 A Harlem man combines his love of woodworking and historic vehicles to create lifelike sculptures of a 19th century locomotive and vintage cars. People can find all kinds of ways to spend their golden years. Some cultivate a hobby. Others prefer to volunteer. Still others like to keep history alive. Local resident Gary Russeth, a Minnesota native who retired in Harlem in 2005, is into all three. In his spare time, Russeth and his wife, Jean, run their Ollie Also and Stanie Too Fine Mess Old Car Museum of Harlem, Georgia, where he displays his large woodcarving sculptures of a train and vintage automobiles. “I’ve always been an enthusiast of Laurel and Hardy, and I thought Harlem was a good place to retire,” says Russeth, a former Marine who spent his professional career making life support equipment for helicopters. He and his wife had visited the community for the annual Laurel and Hardy Festival before retiring here. Now they stay busy with the museum, where his wooden replica of the General, a 4-4-0 steam locomotive built during the 1850s, sits outside. However, Russeth would like to find another home for the train. “I’d like to put it on permanent display someplace, and I’d like to keep it close by,” he says. After all, the project is one that is near and dear to his heart, so he wouldn’t want it to stray too far down the tracks. Russeth completed the half-scale replica, which is 26 feet long and 54 inches wide, in 2016 with recycled pieces of wood after four years of work. “I’m still futzing around with it. I made smoke and steam coming out of it by using Dacron to make it look more authentic,” he says. 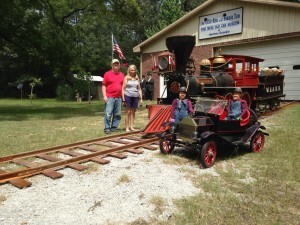 He even built wooden tracks to sit beneath the locomotive. 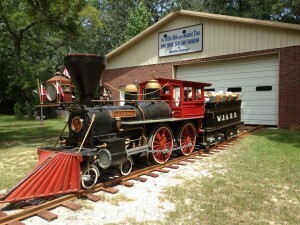 He admits that the real reason he built the train replica, however, was to have a place to put his half-scale marionettes of Stan Laurel and Oliver Hardy. Russeth says he has made about 50 trains through the years. He also has had a lifelong fascination with automobiles and their art of design, and he started carving model cars when he was 13 years old. 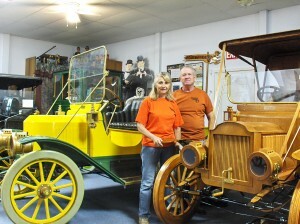 In addition to the General, he has seven wood-carved vintage cars, along with a real Model T Ford, on display at the museum. 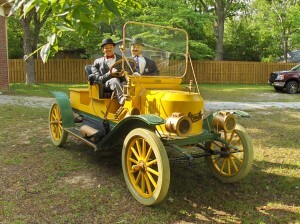 The car replicas include a full-size sculpture of a 1919 Model T Ford touring car, a 1910 Studebaker electric motor car, a 1903 Model A Ford, a 1902 Curved Dash Oldsmobile, a 1907 Buick G Ebony and Ivory, a 1908 Maxwell and a Stanley Steamer. The Model T features life-size soft sculptures of Laurel and Hardy, and the 1926 license plate represents the year the comedy duo first teamed up for the film, 45 Minutes from Hollywood. A realistic crank starts the motor when a dashboard switch is turned on, and an internal electric motor provides the sound of a roaring engine. Head, tail and side lights are illuminated when the motor is running. The sculpture also features a working, two-man, fold-down top; steering and a realistic-sounding horn. Russeth, who also volunteers at the Laurel & Hardy Museum, considers this sculpture a tribute to Henry, Stan and Ollie. The Studebaker sculpture features working doors, hoods, steering, wheels and windows. Varnished rather than painted, the Maxwell showcases its wood origins. “People who come here are not disappointed,” he says. For more information, call (706) 361-5695. Published on July 29, 2018 in Features and tagged front by Kristy Johnson.